In an amazing bit of news today, it looks like HBO's Watchmen series will be upping the ante in the music department. While fans really don't know too much about how this latest series will fit into the timeline of the characters we already know and love, the show is set to be somewhat of a departure that will not retell the story of the comics or the movie, but will be a separate venture that apparently expands on the Watchmen mythology. With an amazing cast already lined up to star in the show, the project just got a pair of musical geniuses added to the already expansive roster of talent. That's right, Trent Reznor and Atticus Ross will be creating original themes and music for the upcoming series. 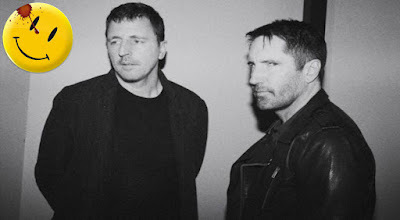 The two have previously worked on Nine Inch Nails and were obviously behind the soundtracks to Gone Girl, The Social Network, The Girl With the Dragon Tattoo, and more.